Sports bars, pubs and grills keep springing up around us like dandelions. This is not a bad thing because these restaurants have really stepped up their quality and selection in recent years. We all enjoy the informal format and appreciate a meal someone actually made from ingredients instead of tapping into an industrial source. 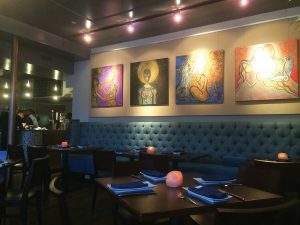 But when it comes to what I personally refer to as “Big Flavor” – referred to more formally as New American or Fusion cuisine – the options in Worcester considerably diminish. 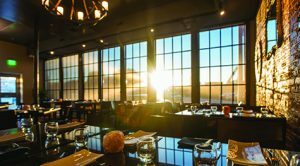 These are the places with creative, experimental chefs who aren’t afraid of unusual ingredient and cuisine combinations, who challenge us with bold dishes that reawaken the dining experience. To my considerable pleasure, we encountered that on Water Street at Lock 50. The format’s a bit daintier than most New American venues; no mason jars or mismatched flatware here. 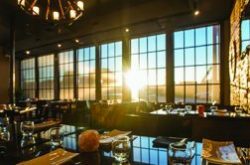 Lock 50’s one of the more sophisticated dining venues to come to Worcester in a while. And it has an extraordinary staff that “lives the mission,” providing expertise, enthusiasm and soul. So if you’re ready to deal with silverware that keeps clattering off your plate, buckle up and get ready for some memorable dining. Octopus Croquettes, perhaps? We started with Marinated Sardines, a small plate ideal for sharing. Sardines have a less-than-fascinating reputation. But after some considerable questioning of Matt, our server, we decided to take the plunge. What I didn’t want was canned sardines packed in oil or another format more associated with feline dining. Au contraire! These were freshly marinated fillets with a tinge of tart vinegar that didn’t completely conceal the flavor of the tender silver-skinned fish. 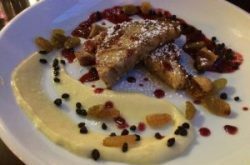 The soft fillets were pressed onto slices of grilled rustic bread; the plate was sprinkled with tiny currants, each providing a spark of flavor and a generous scattering of pine nuts. For flavor contrast, the plate was heaped with a tangle of sweet onion marmalade and the sardine crostini were topped with softened greens. Visually attractive, flavorful and imaginative. The die was cast. 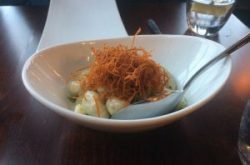 With our second small plate, Potato Gnocchi, the chef gave subtle elevation to basic Italian peasant food. 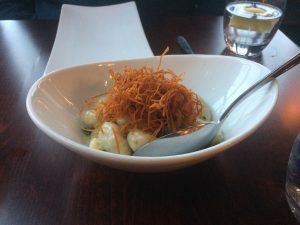 His gnocchi were perfectly executed – puffy, tender and classically formed. Their delicate flavor was enhanced with creamy-soft blue cheese and narrow slices of scallion. All that softness was topped with a golden crown spun from sweet potato threads fried till crispy and brittle. 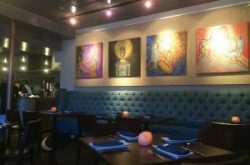 Matching the sophistication of these dishes, Lock 50 has also engineered the environment of its dining room with a jazz-edged Afrobeat soundtrack and artwork on the walls. Neither are overwhelming, both asserting a sense of singular place. From the moment we pushed the gleaming chrome grill of the front door, the feeling of crafted space impressed. This brings me to our “large plate,” Lock 50’s Cassoulet, another dish with peasant roots, this time from the South of France. For many chefs, this can prove a perilous dish; one I love to order but all-to-often find disappointing. Not so at Lock 50. For the most part, the chef hewed to the classic format: white beans are blended with shredded chicken confit – mellow and rich – then ramping up the complexity with bits of pork belly. This could become a work of thudding richness for richness’ sake except for a couple features. First, the bits of spicy sausage. Few and far between, the occasional morsel that turned up on our forks was so tasty that it seemed to set the flavor of this dish on fire. For textural contrast, the cassoulet was topped with a crunchy-tart salad featuring golden-skinned apple slices. But there was another aspect to this cassoulet that mystified me in a very good way. Bringing the elements of the dish together was another ingredient of subtle flavor and seductive texture. I couldn’t determine what it might be, so I asked Matt, “Are these bread crumbs?” “Marrow crumbs!” he replied. Merveilleusement délicieux! Lock 50 has two floors; downstairs, on this particular evening, one of its themed wine tastings was in progress, and the room was filled to capacity with a high-energy crowd enjoying live music, plenty of wine and appetizers. Upstairs, the dining room was much quieter and conducive to fine dining. And soon, as winter relaxes its grip on Worcester, the patio will open. The Canal District’s fabled waterway exists in our collective imagination. 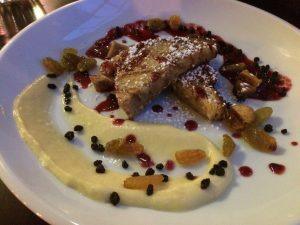 Lock 50, on the other hand, is genuine dining based on the skill of a very creative chef.